Some time ago we were contacted by the fantastic soap maker Nicole from Les savons de Nicole she wanted to try Woad to make a blue soap. We have been looking into new and more affordable natural blue dyes and were really exited to try out Logwood and pass some onto Nicole to try Logwood soap making. However, when it arrived we were disappointed to discover that the logwood powder was a deep and rich brown. We offered Nicole some of our Madder to have a play with instead and you can read about the results here. We are often surprised at the beautiful and unusual results we get when playing around with natural colours but Logwood was one of the most surprising I have come across yet. When testing out the colour on a piece of fleece I discovered, on rinsing, that the water ran out a deep red and left us with a beautiful, solid dark blue! I was very exited offer Nicole a sample of Logwood to have a play with. What happened with the soap was even more interesting, she sent us photographs of the process showing us the soap making process showing us the dye in the oils, the water and the water and lye. The results looked very promising and the soap batter had a lovely deep blue colour. Anyone who has worked with natural dyes will know that there is always that exiting moment when you get to see how your project has turned out, you never quite know what you are going to get and in the case of logwood soap the result looks…well, kind of like chocolate. Although not the blue we were hoping for we still love these beautiful soaps Nicole sent us, they smell amazing and they look almost good enough to eat! 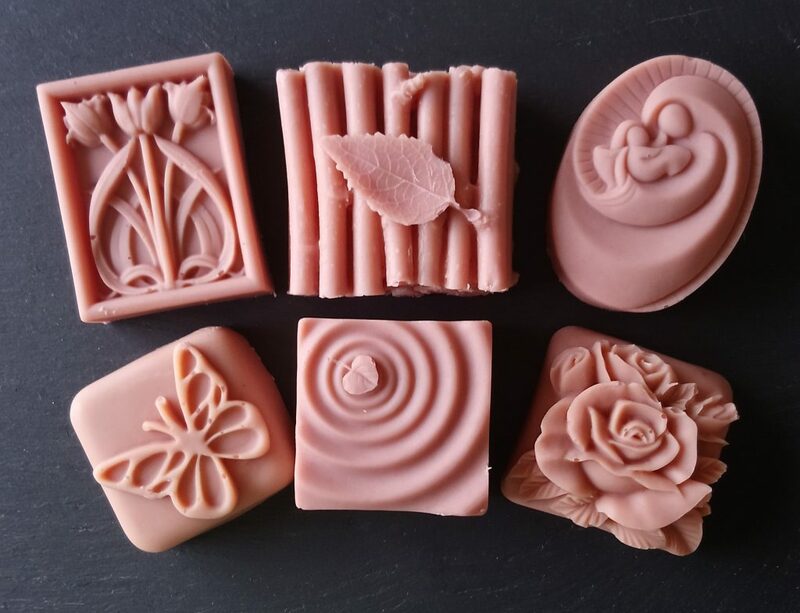 Special Thanks to Nicole from Les savons de Nicole for the wonderful soap, we look forward to more exiting experiments in the future. If you would like to try out our range of natural dyes you can find them here. You don’t always get what you want, but sometimes it turns out better than you thought! As summer makes its presence felt here in the southwest, beautiful colours are all around us. The garden at Sheepskin Towers is in full bloom, this year we have planted a wide variety of alliums. Alliums are providing some of the most beautiful blooms and we have certainly had some surprises. This amazing flower was part of a group of mystery bulbs we were given. I have never seen a flower quite like it, it has so much nectar that little droplets fall. The delicate flowers let the sunlight shine through in the most beautiful way. I tried to capture a photograph of the way the light shone through. However, the sun behind it meant it came out quite differently. Differently than I expected but still very beautiful. Often when I experiment with dyes and mordants the colours and patterns that come out are not at all what I expect. This is one of the best parts though, so often I create something that is way beyond what we hoped for. For me, one of the most exiting things to do is Tie Dye, we never know how it will turn out until I untie it. I think one of the most wonderful things in life is when it surprises you with something beautiful. Why not try out our range of natural dyes here. You never know, you might get some beautiful surprises of your own. Some of you may remember that last year we were lucky enough to have a family of house martins nesting right outside our bedroom window here at Sheepskin Towers. The martins nest is a target for house sparrows. Although house sparrows can make their own nests they will often try and take over a martins nest. Last year we cam up with a solution to help the Martins stay safe and get to watch the little babies fledge safely. House martins are migratory and after the summer ended they left for warmer climates. As our UK customers will know, this year saw some of the coldest weather for a decade, strong winds, rain and even a healthy fall of snow. The defence we put up against the sparrows tangled and made the nest an easy target for the sparrows who were here all winter. This gave them the chance to get in early before the martins returned. I looked out of our window one morning to see a busy little sparrow happily lining the nest with grass and proudly singing out to his mate. Ah well, I have to admit defeat and let the sparrows have it this year. The matins have now returned from their travels and have found safe nesting space in the stables across the road. I guess this year we will have the joy of watching a brood of little brown babies grow and fledge. Updates to follow. Today was the first bee first aid of the year for us. The equinox is here and after not one but two punishing snow storms it looks like spring is finally here. As spring approaches we see the insects start to stir and go about their business. The sight of a bumble bee buzzing around the garden is, for me, one for the sure signs that spring has sprung. Bees are by their nature, well busy. They work constantly, sometimes to the point where they will deplete their own energy levels. So much so much that they don’t have the strength to fly home. If you, as I did this morning, find a bee too exhausted to fly you can easily help it. 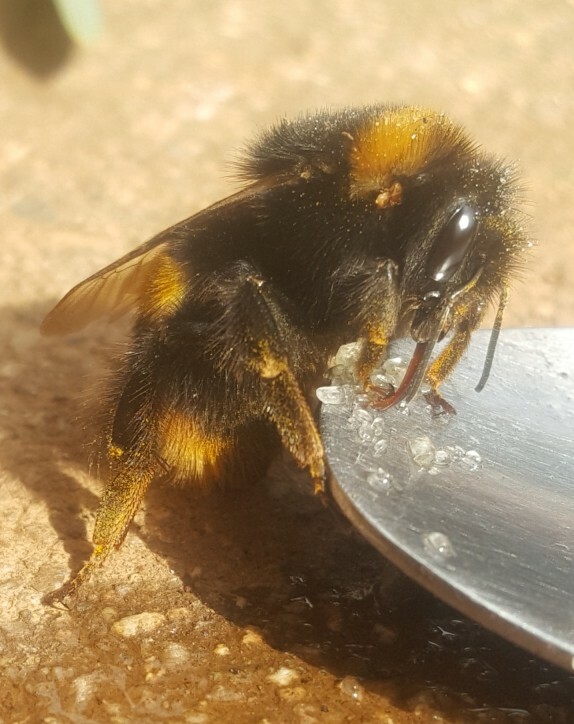 All you need to do is mix the sugar into the water in the cup so it dissolves, carry it out to you exhausted bee and offer them a small amount of the sugar water on the spoon. It is a truly lovely thing to watch as the bee sups up the sugar, it is not often we can get so close to these beautiful and vital insects without some fear of being stung but in this case the bee will be too focused on its own survival to be worried by you. It will also be too interested in the food to think of much else. A close look and you can see the bees tiny little tongue licking up the food and getting the energy they so badly need to get back to the nest. After a little rest on the wall the bumble bee we fed this morning flew off high into the air. It is a wonderful thing to do and, if you have children, a fantastic opportunity to let them see these lovely creatures up close. It is also a chance to talk about the role they have in keeping this planet a healthy one. In the spirit of spring time, and because we are feeling a bit warm and fuzzy having saved a bee, we would like to offer you this discount code. Happy equinox and happy bee saving. For more information about other ways you can help bees, as well as other animals, the RSPB website has several lovely ideas and lots of information. People love doves, they are a symbol of peace, their gentle coo warms our hearts and brings a warm glow to bodies but not so the pigeon. Seen a plenty on our streets the humble pigeon, often called a sky rat, is hated by many. There is a slight problem with this though, there is no difference between a dove and a pigeon. Our city pigeons are actually the feral descendants of the Rock Dove. The Rock Dove – What many would call the common pigeon. Before becoming domesticated, the doves lived on the cliffs but found a happy life alongside humans. They are amazing companion birds who have a strong bond with the humans who keep them. They also mate for life and raise their young as a family unit. Uncles and aunts helping to guard the nest and even sitting the eggs and hatchlings. As well as being sweet natured and loyal, they have served humans for hundreds of years. They have saved lives and won medals. The PDSA Dickin Medal was instituted in 1943 in the United Kingdom by Maria Dickin to honour the work of animals in World War II and has been won by many pigeons. Maria Dickin was the founder of the PDSA. White Vision – a Pigeon who delivered a message that led to the rescue of a ditched aircrew in October 1943. She flew 9 hours in bad visibility and heavy weather with strong headwinds. Kenley Lass – a Pigeon who who was the First pigeon to deliver intelligence from an agent in enemy-occupied France in October 1940; served with the National Pigeon Service. She was parachuted with the agent and released 12 days later to fly 300 miles back to home in less than 7 hours. Recently I have had the absolute pleasure of watching these pigeons nesting on a balcony in Torquay. The little hatchling has survived Herring Gull attacks and the deepest snow this country has seen for more than a decade. Perhaps, the next time we are annoyed at a bit of poo on our car or think of the scavenging sky rats eating from our bins, it might be good to think of the lives that have been saved or the strength of bond these animals have both with their flock mates and with us. Stunning scenes during today’s snowstorm, including ice across the entire width of the River Dart at Totnes.